Every breeze brings the plop of falling persimmons and black walnuts. Both crops are large this year. My stash of black walnuts is growing slowly. Part of this is my fault. It takes time to go out picking them up. The trees are another part of the problem. I gaze up and see branches laden with black walnuts. The trees are too large for me to shake. The nuts are too high for me to hit or pick. I am a slave to the wind. Persimmons are getting ripe now. They fall when ripe. It is not a good idea to pick persimmons. Even raccoons do not pick persimmons early. This American persimmon is ripe and ready to pick. The wrinkles hide a sugar packed burst almost like a piece of candy. Early in the season, ripe persimmons drop to the ground. Late in the season they must be shaken down or they dry up on the tree. Birds do snack on them. For the uninitiated, green persimmons make your mouth draw up into a pucker. It leaves the inside dry and mealy. And the bitter taste is added on top. This result does not wash out easily. Eating a ripe persimmon definitely helps get that green persimmon residue out. A great way of using persimmons and black walnuts is in persimmon bread. The rich taste of the persimmons is offset by the sharp acid tang of the black walnuts. “Exploring the Ozark Hills” has a recipe. Since the two are both ripe now, it is tempting to go out and gather the two up and head into the kitchen. There are a couple of reasons not to. Black walnuts must be hulled and dried or cured for a month before being hammered out of the shells. This lets the oils settle. 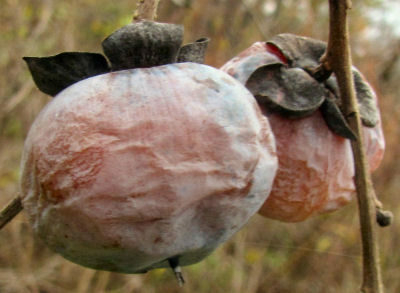 American persimmons have thick skins and numerous, big seeds. Both must be removed before using the persimmon pulp in any recipe. Separating that pulp is not easy. I’ve tried several methods. Boiling is a disaster. Rubbing through a sieve is not much better. Perhaps a ricer would work, but I don’t have one. What I do have is a freezer. After cleaning, the persimmons are dried off, dumped in a freezer bag and frozen for a week or so. They are so full of sugar, it takes time to completely freeze them. Then thaw the persimmons. The skins slide off. The seeds pop out with little effort. 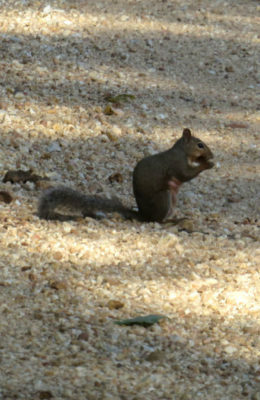 This young gray squirrel is out on the road eating black walnuts. The road is neutral territory for squirrels, but dangerous because of traffic. The squirrels will spend hours grabbing nuts and carrying them off. Persimmons and black walnuts have other fans. The goats inhale any persimmons they find. And they do search, snuffling through the grass. They know every persimmon tree in their pasture and visit daily. From the trails elsewhere, deer do the same. Black walnuts are a favorite of squirrels. They depend on walnuts for winter stores. I tend to be a sloppy picker and leave many behind for the bushy tailed crowd. When the persimmons and black walnuts fall, the leaves are turning, the nights are cooling off and autumn has begun. This entry was posted in Ozark Hills and tagged American persimmons, black walnuts, using persimmons in cooking on October 3, 2018 by [email protected].